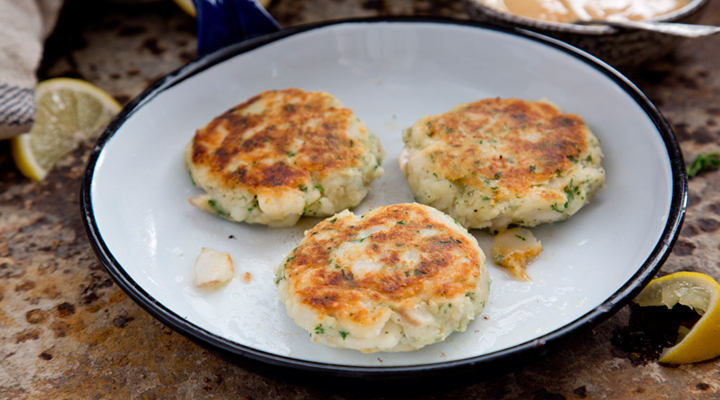 These delicious homemade fishcakes are perfect for using up leftover cod and potatoes. Cook the potatoes first so that the mash is ready to go. Poach the cod in a pan of simmering salted water for 8 to 10 minutes, until it's firm and cooked through. Drain and cool. Place the cooked mashed potatoes in a large bowl and mix in the parsley and thyme. Flake in the cod and add the beaten egg, season with salt and pepper and mix well. Divide the mixture into 8 portions and shape into cakes. Place the flour in a wide, shallow bowl. Dip the fish cakes in the flour, shaking off any excess. Warm the oil in a large frying pan set over a medium heat. Once it's nice and hot, add the fish cakes and cook for 4 minutes on each side. Serve with sweet chilli mayonnaise and a lemon wedge. Your cod fish cakes recipe is excellent.